Memorial Day - a day to remember those who gave their lives to set and keep us free. I am sure all of you have family members, church members and friends who have served in the military. Some of you have someone near you who is serving this very minute. Today is a day we set apart to say, "Thank You." As I reflected on what today meant, I was reminded of David's proclamation. As you spend time with your family today, I am sure you will stop reflect, remember and thank God for the men and women who have given their lives for us. Our freedom of worship, to read the Bible, speak of our God was costly for many families. It is important that we do not take those sacrifices for granted. In the same way, as Christians, we do not want to take for granted the greatest sacrifice made for us. We belong to the family of God because of His willingness to give His son for us. I know you already know and believe this, but are you remembering in your daily walk? Take time as you remember our troops today to remember our Savior today. As you remember, do not stop there. Tell, talk, share with your family, neighbors, world. Let the generations rise up and praise, so all the world will know. How 2 B a Cheerleader? Recently, Dana posted on the importance of having and being cheerleaders. She was right in highlighting this important aspect of being apart of the body of Christ. Especially with our husbands in ministry, we all know what an important role we play by supporting them in this way. After all, if we don't cheer them on, we can't expect anyone else to do so either. While I am not privileged enough to hear my husband preach every week, when I do, he seeks my feedback. Over the years I have learned how to balance both the praise and constructive criticism that he is looking for. He desires my honesty, but I know how fragile his ego can be at times too. Sometimes I do better than others at being his cheerleader. A minister's wife I know says her husband never seeks her opinion, so she rarely shares it even though she wants to support him. Then another minister recently told me that he doesn't seek his wife's input- not because she doesn't care or isn't interested but because he feels like she is too biased and can't be subjective. So, we walk a a delicate line as ministers' wives. What are some things you do to keep the balance? There are a wide variety of ladies that read this blog. What you share may be just what another dear sister of ours needs to hear. I don't know about what part of Tennessee or the world that you may live in, but our part is still drying out from the historic Great Flood of 2010. 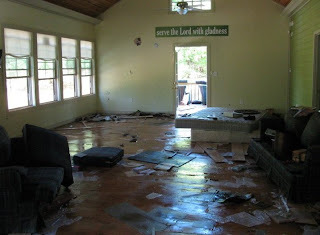 God's providence saw fit to spare the Vinson Clan of any water damage, but we have been nothing short of amazed to see the pictures and hear the stories of the flood. One such story I am "pasting" below. The author is an amazing young, single adult who has seen God's providence move in the flood like she never imagined, or could have predicted coming. Please take a moment to read her story. You won't be sorry! The attached picture was how she found her house the day she was allowed back home. *This is the unedited, unrestrained glimpse into the mind of a girl who just "lost everything". What I have: one outfit, my gray sweats (seriously...who would leave those behind? ), a few toiletries, one picture album, one journal, a few photos, my pocket Bible, a few books, two sets of extra contacts, tennis shoes, workout clothes, birth certificate, passport, and wallet. What I don't have: everything else. Most heartbreaking are the irreplaceable things like non-digital photos, every letter I've ever received, things I hoped to pass on to my children, journals that detailed my walk with Christ thus far, memorabilia from time spent overseas, books with notes from friends and my own quiet times, and home videos. I haven't cried many tears over furniture, clothes, food, etc...but my heart is broken over these few small, invaluable items. What I have: all the same tools to share, glorify, and worship Jesus Christ that I had yesterday. A mouth to speak, ears to hear, eyes to see, hands to toil, feet to bring the Good News. A roof under which to sleep, friends and family to listen, food to eat, clothes to wear (although you might see me in my gray sweats even more than you thought was humanly possible to wear gray sweats), a cell phone to talk on, a laptop to communicate, a car to drive, a bank account. I still own more worldly possessions than most people in the world. When you're a kid, everyone says, "What would you take out of your home in a fire?" The truth is, it doesn't matter what you take. I always said I'd take pictures, journals, money, Bible, etc. But it really doesn't matter. When it comes right down to it, even if I had managed to take every single thing that I thought I'd want or need, I'd still have something I wished I'd gotten. It's all under water. All of it. And one year from now, I guarantee you that it won't matter. Life will go on. I've often said the best thing about being back in Tennessee was living alone in the woods in "my house" on my uncle's farm. And it's true. I loved that house. And I loved those letters. And those pictures. But my love for God should make my love for those THINGS look like hatred. And I'm pretty sure I loved all of those things a little too much. For someone who has always prided herself in frugality and simplicity, this is a big reality check. I love things just as much as the average spoiled American. I haven't been to the house yet--the water is up to the windows right now and no one can enter. I'm sure it will be devastating. It's no one's fault. You can't control nature...or God...or life. No one could have predicted how the water would rise so quickly. I beg the Lord to help all of us remain free in Him without laying blame on anyone, especially ourselves. The Lord has already reminded me that I don't need things to pass on to my children--I have an eternal inheritance of faith in Jesus Christ to pass on. What else will they need? But I sang in the shower this morning...so I'm still singing. Don't waste your life...on things. If you want to read more of Susan's Story check out her blog: http://susanebriggs.blogspot.com/ . She has also been willing to speak about her experiences where ever God has opened the door. You can contact her through me, or her blog too. Please feel free to respond on this blog with any flood stories of your own. God is using this "disaster" to do amazing things. Tell us about it! I always wanted to be a cheerleader. Dreamed of it. Longed for it. Even attempted to try out for the squad….but at the last minute was disqualified for having a “C” in Citizenship on my report card—for “whispering too much” of all things!! I spent more of my time in school talking than learning!! I may never have been on the cheerleader squad in high school or in college, but I am a cheerleader!! You see, sometimes what my husband needs is a cheerleader. Someone on the sidelines telling him "You can do it". "Go for it". "You are amazing". "I love you". "You are such a Godly man". Etc. Our children also need a cheerleader. Someone who will tell them they are precious. Loved. Smart. Funny. Someone to ooh and aah over the little things they say and do. Someone who will tell them they can do it when they are fearful and tired. Listen to a sad, heartbreaking comment I heard the other day. “I hope somebody thinks I'm quite wonderful, but it isn't my Mother.” Doesn’t this break your heart? Is this something you could say? Do you feel that you are wonderful only if you “perform” well? Are successful? Do what people want you to do? Everyone needs a cheerleader. We must be someone’s’ cheerleader. We must be the one that ooh’s and aah’s when the simple things are accomplished. We must celebrate who they are…not what they do. If we are not careful, we can make people think that performance is what is important…Especially minister’s children. Who is your cheerleader? Who needs you to be their cheerleader? This was posted on Facebook this morning. The precious woman who wrote this Facebook post lost her mom a few years ago and she desperately misses her….she left church crying Sunday. It was just exactly what I needed….validation. It has been heavy on my heart ever since Mother’s Day weekend that so many women are hurting right now. This is often the most difficult time of the year for multitudes of women….including minister’s wives! I read and heard so many stories of those who loved Mother’s Day. They were so thankful for their moms, for their children, for being able to spend time with them. And all I could think of was the woman whose mom never told her she loved her. The woman who could not go to church on Mother’s day because she longs to be a mom and it is so hard emotionally to celebrate the day. The child whose mother is not at home because she is fighting for our country’s freedom and the freedom of people around the world. The woman whose mom died. And on and on…. Let’s ponder how we can minister to those who suffer, often in silence, on Mother’s Day and let’s do what my sweet friend suggested….Tell your mom you love her! AND be a cheerleader to someone whose mom is no longer around. By the way, after several texts and coercing, we made the lady who wrote that Facebook post come over for lunch after church Sunday! Oh, and we asked her to go the store for us to pick up some stuff complete the meal!! How is that for making someone feel a part of the family? My dad’s name is Jack. He is a fun, outgoing guy from California who, last week, at 83 years old, drove all by himself from San Diego to Indianapolis in his hot red convertible sports car to visit us. The week went by too quickly, and before we knew it, it was time for him to “hit the road again” and head off to Texas to see my brother. My dad had never met two of our daughter’s three children, Anne, who is almost one, and Jackson who is almost three. They all took to him immediately and, surprisingly, he was very patient and kind with them. Jackson was named after my dad. What an honor to have someone named after you!! Funny thing, they are a lot a like in a number of ways. Jackson likes things “just so”….cars lined up, blocks stacked "his" way....and so does my dad!! Jackson LOVES ice cream and my dad had a huge bowl of vanilla Blue Bell ice cream (yes, hallelujah! Blue Bell finally arrived to Indy!!) every night with chocolate syrup on top. There is one major difference, however. Jackson is learning of the love and sacrifice of my Jesus and my dad has no interest in Him at all. For years it has been such a burden for me for my parents to know my Jesus. My mother died never knowing Him….a burden that is so heavy for me to bear that often times I am crushed under the weight of it all. My prayer during my dad’s travels across the US is that He would have an encounter with Jesus similar to what Paul had while he was traveling on the road to Damascus. I also want you to know that today, as I pray for him, I am praying for your family members who also do not know Jesus. God's word is full of commands to tell our children about all He has done. It does not seem like a difficult command, yet I wonder if your children are hearing about what He has done or about what you are doing? Psalm 78 is a wonderful chapter in the Bible that reminds us how very important it is for our children to hear what God has done for us. It says in vs. 4 "We will not hide them from their children, telling to the generation to come the praises of the Lord, and His strength and His wonderful works that He has done." It is easy to complain and criticize in ministry. Sometimes the stress of everyday service to the people in our church becomes drudgery instead of delight. Of course when this happens, our mouths tend to reflect our heart and our children hear more about what we are doing instead of what God has done. As the Psalmist continues in chapter 78 he reminds us, "That they should make them known to their children; that the generation to come might know them, the children who would be born, that they may arise and declare them to their children, that they may set their hope in God, and not forget the works of God but keep His commandments..."
Our homes must be the living example of true Christianity. Children need to be taught to talk to God and to thank God. Our children learn by our example. Take time to pray with them about difficult situations and let them hear you praise the God you love for all He has done, is doing and will do. Tell of His wondrous works from generation to generation. I have been reviewing a book I read some time ago. It is "I Saw The Lord" by Ann Graham Lotz. It has been awhile since I read it, but I still remember how God touched my heart through her writing. The first time I picked up this book I was in the middle of chemo treatments. I was very sick, exhausted most of the time and spending lots of time in pain and in bed. God used this book to remind me that no matter what was going on in my life, He still had work He wanted to do in and through me. I just want to share a brief portion that I hope will be an encouragement and reminder to you, as you minister to those around you. "Personal revival is ... Jesus in you and Jesus around you and Jesus through you and Jesus under you and Jesus over you and Jesus before you and Jesus behind you. Personal revival is just Jesus ... Jesus on your mind, Jesus filling you heart, Jesus overflowing from your lips." Take time today to sit at His feet, listen to His voice and obey His call. Jesus is the same yesterday, today and tomorrow. He has a plan, let Him show you and renew a fresh spirit within you! Have you noticed that daily the world around us is changing? It seems some of the biggest changes in my lifetime have happened in the last few years. Does your cell phone take pictures, send texts, receive emails, play music, identify callers with photos and on and on? For some of you this is no big deal because this is your generation of technology, but believe me, these are amazing things for those of us with a few years on our bodies. With all the new inventions or what our world calls advancements it would seem logical that we would be more at peace and more secure than ever before. Is that true in your life? Do those around you seem happier, content, fulfilled and living with purpose? In spite of all the things that we have to make our life easier or maybe just make it faster I am meeting with women all over our country who are experiencing more stress and frustration than ever. I am hearing of depression that is drowning women from state to state. What is going on? As we minister to the women God brings in our lives, we must remember there is only one anchor. We have the foundation we need to handle the changes, but the changes themselves cannot be that foundation. The Word of God is what we need. God's Word is our comfort, guide, hope, wisdom, peace and answer for everything. We come into the presence of our God through His word. As technology grows it seems we are not less busy, but more busy. It would be easy to spend more time on those wonderful cell phones, in front of that computer or reading that kindle instead of listening to God through His word. Yet, God tells us in Isaiah to "Hear, O heavens! Listen, O earth! For the Lord has spoken." He reminds us to "Hear the word of the Lord." "Listen to the law of our God." Our world needs God's word to stabilize it, you need God's word to stabilize you, your women need God's word to stabilize them. Stay in the word, share His word, remind those God has given to you for ministry that God's word is eternal and stands forever! Does the Lord Have a Sense of Humor? I know for a fact that God has a sense of humor. Just look around at nature. There are some animals like the giraffe that you just have to wonder what the Lord had in mind when He created this beautiful creature with such a long neck. In addition, how can you not giggle when you spot an elephant with its long trunk? I do not think we will ever know the why behind these creatures until we reach heaven, so until then we must wait. Waiting is not my gift. I have always been one of those people who want answers now. Waiting in long lines are a miserable experience for me. In my hurried, crazy day I just cannot stand the waiting game. In my Bible where this passage is, both margins are covered with prayer request. Some God has answered such as a godly wife for my son, Stephen. Others are still unanswered like allowing my youngest son, Bryan, to find a job in baseball and his heaven-made soul mate.